This is the next in our “Steam Route” series and features the 1960s days of steam traction between MANCHESTER and LANCASTER via WARRINGTON, WIGAN and PRESTON. In Manchester there are a few more views of steam at Manchester Victoria that leads, as does Platform 11, to Manchester Exchange. West of here was Patricoft shed, which is visited in its last year of steam operation. We now reach the West Coast Main Line via Latchford and Arpley Junctions into WARRINGTON BANK QUAY Low Level platforms. The freight yards here were still busy with steam hauled trains and the West Coast trains are seen from them with trains ascending and descending from Acton Grange. Next there is much activity through WARRINGTON BANK QUAY High Level platforms before we travel northwards to WINWICK and then WIGAN where both North Western and Wallgate stations are seen with steam..
Onwards to PRESTON via Farrington Junction with views of Skew Bridge and steam activity in Preston station on both the main line and the erstwhile East Lancashire line. There are good views of steam at Preston No.5 signal box before we finally head north for BARTON and BROUGHTON, BROCK water troughs and GARSTANG before arriving in LANCASTER. Motive power seen is both ex-LMS Stanier and BR Standard locomotives, including a few Royal Scots and Jubilees. The archive film used is in colour with an authentic sound track and an extensively researched commentary. Cover Photo:- Keith Pirt/Courtesy Booklaw Publications. Black 5 45377 meets a Britannia at Euxton Junction. A video featuring the line between MANCHESTER and CREWE. Particular emphasis is on the two places, one a city and the other a railway town. Filmed in the 1960s, steam traction predominates. MANCHESTER VICTORIA and the nearby MANCHESTER EXCHANGE stations were busy with passenger, freight and parcels traffic. It was at the foot of MILES PLATTING incline where banking often took place. At the summit was NEWTON HEATH shed and a visit is made there. The line from MANCHESTER PICCADILLY was electrified from 1960 but steam power existed here alongside the new AC electric locomotives. At the northern end, STOCKPORT kept steam until 1968 and as well as the station, EDGELEY shed is visited. We then travel southwards through CHEADLE HULME, WILMSLOW, GOSTREY and on to CREWE where a wide range of motive power is seen from 1962 to 1968; Princess Coronations, Jubilees, Royal Scots, Crabs and Jinties along with BR Standards, Stanier Black 5s and Stanier 8Fs. 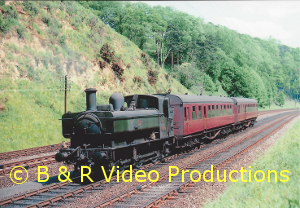 There is much nostalgic archive material used in this video of a past history when steam power could still be seen regularly on British Railways. Cover photo: Keith Pirt, 8F 48765 at Manchester Piccadilly, April 1965.